This is a short prayer which I have composed as the world enters 2012. Undoubtedly these are trying times for humanity as the period for the fulfillment of the Indian Prophecy of 21 December 2012 approaches. 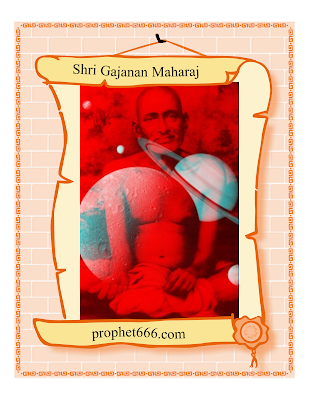 Very few real life photos of Shri Gajanan Maharaj, the great non-dual saint of Shegaon in Maharashtra are available. I have generated a 3 D image, which is affixed in a photo frame. This is a Laxmi Mantra Sadhana which is practiced to attract wealth. This meaning of Sadhana, for those not accustomed to Indian religious terms is “the single minded practice of a ritual to achieve a pre set goal”. Now this Laxmi Sadhna involves reciting the mantra which I have given below 21,000 times. This recitation has to be done in solitude. Converting local temperature heat into reusable electricity lets a space settlement be enlarged big enough for many billions (1,000,000,000s) to happily enjoy living together in, (while staying thus forever nicely cooled), such as in a Fullball balloon world afloat in space. One such settlement can get expanded to 150km radius good for over 1/6 trillion people (177,000,000,000)! 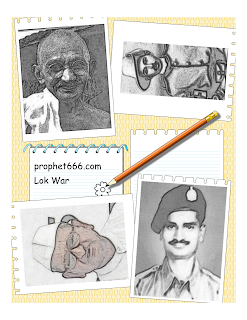 A lot of my readers write to me, asking for more and more mantras for enemy related problems. A common complaint is that a lot of enemies have ganged up to trouble them. This here is a Videshan mantra. This is a Yantra which was used in olden times, to gain prominence in the court of Kings, and gain their favor. In the present times, Kings have been replaced by powerful politicians and rich and powerful people, who can make or break lives. This simple Yantra has to be written on a Bhojpatra leaf with the juice of a rose. Then it has to be put in a locket and tied on your forearm. Doing this is said to win favor of Powerful people. The Lokpal Bill was finally introduced in the Lok Sabha, amidst uncertainty over its contents till the last minute. As I had expected the powers behind this government, disclosed their trump card at the last minute – Divide and rule India. There is 50% reservation for Scheduled tribes, Scheduled tribes, Other Backward castes, women and minorities. This is probably what Rahul Gandhi had meant when he said “let’s take this debate to a new level”. How about two edges, one with submicroscopic fronds sticking out tilted up, the second with like fronds tilted down. Then the second edge can slide up relative to the first, but if it receives a sonic speed heat blow tending to make it try sliding down relative to the first, then some fronds catch in the fronds of the first, preventing this unwanted direction motion. Construct such edges maybe on a stationary containing microscopic loop and a wheel inside it, which thus can turn in just one direction, again wanted to convert into electricity. This is considered to be a very powerful and effective Navnath Sampradaya Yantra which is dedicated to Dattatreya. Dattatreya is the Guru of the Nath Sampradaya; he represents the Ever-Existent God who is the combination of Brahma, Vishnu and Mahesh. Mahatma Gandhi launched the quit India movement in 1942; now heading into 2012, 70 years later, Anna Hazare launches the quit loot movement. The Drumstick tree [Moringa oleifera] is widely used in traditional Indian medicine. Most of the parts of this tree have their uses. Some more popular home remedies using this plant are given here. I have highlighted 10 points which are crucial and central to the question weather the Lokpal can stop corruption in India. As we enter 2012 the Euro zone crises looms like a hanging sword on financial markets all over the world; including India. There are bright chances of the Euro zone going into a deep rescission in the first half of 2012, after the January earnings come out. It’s true that this is impacting the Indian financial markets, and will do so more in the near future. If you are an Indian you should watch out for the following signs. This is a very rare traditional Indian remedy which is practiced to control and cure excessive frequent urination in women. This home remedy is also said to be beneficial to general health. This condition can be most annoying and troublesome; especially in some countries like India, where there are limited public toilets for women. A man can easily find some corner; but it is really difficult for a woman. Verse 3 of the Dhyanam of the Vishnu Sahasranamam Stotram is widely recited as Vishnu Mantra. The two words from this Mantra – Padmanabham and Suresham are two of the names of Vishnu. Padmanabham – The lotus shaped navel of Vishnu, from which the universe manifested. Suresham – The greatest of all the Gods. The Black Money discussion in Parliament, about Indian Black Money in Swiss Bank and other tax havens predictably turned out to be an anti climax. The septic won’t be wrong in assuming that the event was choreographed and stage managed for the cameras. As per the yin/yang principle, each force being or event in the universe is described in terms of yin/yang characteristics. The body also is a delicate balance of yin and yang. It has to be noted here that the balance of these two opposites is unstable. I am getting at lot of requests related to home remedies for low sperm count. The reasons for a low sperm count can be due to a variety of reasons; ranging from physiological to physical. Hence those suffering from low sperm count are best advised to get back into peak physical and mental contrition; this is the best medicine. Suppose a thick film is filled with microscopic holes all filled with many molecular scale fronds kept tilted angled to one direction. If inside some fluid having molecular loop components, then their kinetic heat motions will permit them to slip through such holes in one direction. But each time such loop components get randomly bounced to the opposite direction, each will soon get snagged around one of the many fronds and briefly halted, to quickly get bounced back off to the wanted direction. These are some home remedies which are practiced to remove urinary tract infection. Naturopaths and practitioners of traditional medicine recommend one or two of these remedies at a time; depending upon the severity of the infection. Juice of the fresh root of theThe Asparagus racemosus or Shatavari plant. The root is crushed to separate the juice and then the juice is filtered through a sieve. The practitioners of Yakshini worship believe that the Goddess of Wealth Laxmi is also a Yakshimi [the feminine mystical being or energy, who is the guardian of wealth]. Hence the ritual of Laxmi Sadhana is widely prevalent in Yakshini worship. The ritual given here is of the Sadhana of the Laxmi Yakshini. One has to recite the mantra given below 100,000 times; this has to be done in your own home. The Narasimha Avatar of Vishnu, symbolizing the fierce form of Vishnu as half man, half lion is worshipped by many in India. The mantra which is given here is a rare and powerful Shaabri protection mantra recited to seek protection of the self, family and property; including agricultural. This mantra is dedicated to Narasimha. The bugle of Lok War 3 was sounded during anti corruption crusader Anna Hazare’s one day token fast at Jantar Mantar yesterday. A welcome change from the past two agitations is that the gloves are off. The Anna Hazare camp is not targeting the mask; the puppets; but the man behind the mask; the puppeteer Rahul Gandhi. If you suffer from Hypertension your heart has to work harder to provide blood supply to the other parts of the body. This condition of High Blood Pressure is likely to affect other body parts like the Kidneys. Hence along with a proper diet, as per the traditional Indian Dietary Plans, some other beneficial remedial measures are practiced to enhance the healing process. You can try this if you suffer from Hypertension. Diarrhea can be an extremely trouble some and irritating condition. This is more so if you are outdoor or traveling. These are 10 things which I would advise you to follow if you have Diarrhea. Along before the advent of Christianity and Islam, people all over the world were worshipping “Phallus” as the one who created the world. Ancient Indians worshipped the “Shivlingam” as the divine light, which gave life and energy. Though today most Hindus have forgotten the real symbolism of the Shivlingam. This is a very rare, secret and powerful Mantra for success in life. To practice this Mantra one has to take some water in a glass and holding that glass in one hand recite the mantra 17 times. Doing this binds the water with the Mantra. In case you burn yourself and are in a remote place where no hospital, ambulance or doctor is available, here are some immediate remedial measures you can take. These remedies are for burns which are not very severe or widespread; but for minor burns. Traditional Indian Dietary Plans have always highlighted certain norm to be followed as regards meals. Indian naturopaths always advise their clients to follow these norms. These are 8 things which you must remember while taking meals. Fresh Air is as beneficial to great health as Sound sleep. One can live for a number of days without food or water but it is impossible to survive without air for a few minutes. This alone shows how important air is for our survival. After a days hard work sound sleep at night is most essential, this ensures that we recharge our life energy, for good health 6 to 8 hours of sleep is essential. For children 8 hours of sound sleep is recommended. Sound sleep is a great remedy for good health. Chapter 11 of the Bhagavad-Gita deals extensively with the cosmic or universal form of Vishnu.Shri Krishna the 8th Avatar of Vishnu describes his universal from to Arjuna,the warrior. Through this chapter one can find the key to the manifestation and the meaning of the 10th and last Avatar of Vishnu the Kalki Avatar. Humans had long used sonic speed kinetic heat molecular motions, such as to help dissolve things. Hotter faster moving liquid's molecules contacting some soluable solid might strike some of the solid's surface molecules hard enough to give them fast enough random sonic speed heat vibrations to become able to break free from the solid form, and thus end up dissolved. It is one of the primary laws of nature that you become what you desire from the deepest part of your sub-conscious mind. Most people seek one thing or the other, life begins in seeking and ends in seeking. Most people desire some sort of power or the other, which would make them superior to others or their peers. A lot of requests which I get are related to desire to seek power. Shri, Shree, Sri are some common Indian words which one hears everyday. Written as श्री in Sanskrit, Hindi or Marathi this word is taken for granted, as short form of Mr. [Mister]. Other variations include Shriman, श्रीमान् [full form of Mister], Shrimati, श्रीमति [used to address married women] or Sushri, सुश्री [ladies respectfully addressed as]. In an age where Money makes the world go round and round, the most requests which I get are of more and more Wealth Mantra. The most common problem which most people face is undoubtedly the Finincial Problems. So her I am giving one more strong and powerful Mantra which is to be recited 108 times daily. Aloe Vera is an herb which is widely used in Herbal Remedies.I have picked only the most simple home remedies which can easily be practiced at home. This herb is also said to have healing effects in controlling and treating an overgrown Liver. A most simple home Remedy practiced is to take 1 table spoon of Aloe Vera juice for 21 consecutive days. 21st December 2012 is now just a little over a year away. A crescendo is going to built up as we approach D Day. I have been studying and writing about this much awaited event for some 3 years now. There is definitely going to NO END ON 21 DECEMBER 2012. Having said that, I do not mean that there is going to nothing; a lot is happening and is going to happen in the very near future. Ancient Indian scripture have always had hidden Keys inserted in the verses. These Keys have always had a profound Spiritual meaning. This here is a verse from the Ganapati Atharvashirsha, an Upanishad [a text containing wisdom], composed by the Sage Atharva Rishi. The Ganapati Atharvashirsha is an integral part and parcel of worship of Ganesha. This is a rare Shaabri Health Mantra which is written in the olden Marathi script. This is a one of the rare Indian Shaabri Mantras. This particular one which I have given here is a Mantra to cure fever. This Mantra is in the form of a question, after reciting the Mantra, kindly note that one has to take the name of the person suffering from fever; which is the answer to the question. Wal-Mart has described India’s decision to allow 51% foreign direct investment [FDI] as the “first important step” .They of course have not spelled out the “next steps”, which is left to our imagination. That the ongoing economic crisis has affected the retail giants like Wal-Mart, Tesco and others is no secret. That Euro zone faces financial collapse any day is the harsh truth staring down the faces of the financial controllers - New World Order.Desperate plans and conspiracies are underway to offset the collapse.